Will Ferrell isn't the spokesperson esports have been waiting for. Usually, when a big budget movie is announced about your favourite hobby, it's time to celebrate. This isn’t the case with the upcoming esports flick. Maybe it’s the fact that Will Ferrell is starring, maybe it’s the fact that the film will be in the vein of Talladega Nights: The Legend of Ricky Bobby, or maybe it’s the fact that we just don’t trust Hollywood with big budget comedies anymore. Sure, Evil Geniuses and Fnatic are on board, but it’s unlikely that their consultancy role will be enough to stop a film if it's flawed from top to bottom. (In total fairness, we have no real way to make a real judgement call at this stage of production.) While it’s not unusual for a film’s announcement to draw some annoyed commentary, esports fans and content creators alike seem downright agitated about this announcement. This seems to go deeper than the usual muttering and scowling about Hollywood making too many sequels or complaining about the lack of modern classics. Instead, people seem downright offended at the concept, like a dog offered a slice of lemon. In any case, it’s worth examining what makes an esports comedy worthwhile, and why fans are worried that this particular one is going to go horribly, horribly wrong. What makes an esports comedy? You’d have to be disconnected from the field entirely to suggest that esports has no room for humour. One player poured his ramen down the toilet for so long it caused a major plumbing catastrophe in the gaming house. Gamers have gotten into brawls, gotten scurvy, posed for weirdly romantic photos, become best friends, betrayed each other... there’s plenty of fodder for comedy in the day to day operations of an esports team, and there’s no doubt someone could make a fantastic, full length feature movie about the rise and fall of a team inspired by real life events. A story like Origen’s rise and fall from Challenger to Worlds to shambles could easily be reorganized, have some of the identifying facts massaged, and played up in the right places to be a hilarious movie. The problem is that based off what we know so far, we’re not going to get something along these lines. One of the most important foundations of a joke is to identify whether you’re laughing with someone or at someone. Of course, there’s plenty of room for pointed humour (especially in instances where you’re punching up), but for a movie like this, presumably you’d want to have people into esports come and enjoy the movie. If the premise of the movie is laughing at them, then it doesn’t feel like a loving homage or a gift, it feels like a massive middle finger from outsiders. The casting of Will Ferrell as a burned out esports star confirms these initial fears. It goes counter to the actual story of pros burning out in their mid 20s, or retiring gracefully. If they can’t get one of the most basic facts right, what are the chances they’ll pull the rest of the story off? 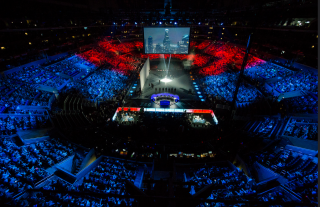 First, esports is still fighting for mainstream legitimacy. This year, we made some important steps. It was easy to point out at a sold out Madison Square Gardens, with thousands of screaming fans losing their mind over the ROX Tigers v SKT T1, and say “this matters.” We love esports. We want to share esports with our family, our loved ones, and that becomes a bit harder when the last mainstream depiction they saw was Will Ferrell trying to get his energy drink branded pants on and falling over into a hedge (or whatever easy joke they end up going with). Something else worth noting is that there are writers within esports who could have told this story and told it well, and made something worth remembering. Black Swan, the Darren Aronofsky film, was set around a ballet star but managed to lovingly linger on the unique details of the dance while telling the protagonist’s story. Hackers, the 1995 classic, wasn’t exactly based in science, but it treated the subject matter with love. There have been mainstream movies about gaming before, ranging from the silly (like Noobz, starring Jason Mewes) to the grim (like the bizarre Michael C. Hall vehicle, Gamer, where Gerard Butler fought for his life in a prison murder video game). How many of them stick in the cultural consciousness? How many people will fondly reference the upcoming Will Ferrell movie? It seems more likely that it’ll, at best, fall into the pile of mediocre 2010s comedies that take a swing at a half-baked concept and miss. This Worlds showed that League is full of amazing stories. ROX v SKT, TSM’s rise and fall, the beautiful story of Likkrit and ANX overcoming their wildcard struggles to make history, INTZ overcoming EDG, Samsung Galaxy’s Cinderella run, and SKT’s eventual victory.. Any of these stories would provide a beautiful backbone for a story, and there’d be more than enough room to stuff it full of jokes. Instead, they’re planning to use a tired Ferrell formula and hope that the novelty of esports will make up for it. Is it possible that I’m being way too pessimistic? Will Evil Geniuses and Fnatic manage to keep the film on track and provide an authentic esports experience? Sure, that’s absolutely possible. Even if this movie stinks, there’ll be other, more promising pieces like the Game Grumps/Rick & Morty creator collaboration. However, there’s the fleeting, painful chance that it could be good, and the near certainty that they will miss the mark is unfortunate. Esports deserves the exposure that this big budget comedy could bring, and it's a shame that Legendary Pictures couldn’t find folks from within the field, or at least those who are familiar with the basics, to tell it.